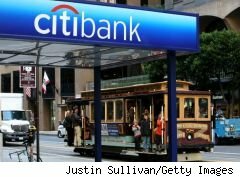 In case you're a Citibank customer and you've missed it, Citi--the financial institution that owns Citibank as well as its Citi credit cards--has launched mobile banking services to smartphones, including Blackberries, Palms and iPhones. As of now, according to Citi's press release, you can viewing Citi account balances and account activity, pay bills and set up payments, make transfers between Citi accounts, locate Citi branches and ATMs and connect to customer service. Citi's group executive vice president Peter Knitzer is also quoted in the press release, saying, "We understand that our customers' busy lives keep them on the go, which is why we want to make it as easy as possible for them to bank with us." Signing in to your account on your smartphone should be easy. You just use the same password and User ID that you would on your home computer.